Hello all you faithful followers of "Bedrock Dreams" out there. My name is Alan, and I do believe I was born with rocks in my head. Just ask my wife and she will easily confirm this fact for you. From my youngest memory rocks have always cast a spell over me and what boy at some time or another hasn't "dreamed of golden treasures?" I was fortunate enough as a child to be born and raised (for the first 10 years anyway) near the mountainous terrain of the southern Appalachians in close proximity to historic gold-bearing ground. So...I became a boat captain instead of a geologist. Now don't get me wrong here as many men might be driven to murderous tendencies just for a piece of the life I lead. My office is the wheelhouse and my workplace the open water. About two years ago, after a load of preparation and at the age of 45 with 3 kids in tow, a few dogs, some cats, a bird, some fish, a lizard, and a snake or two, we pulled up stakes and headed for the hills of North Georgia and a new and different kind of life. Talk about one crazy move (a story for another time though) but we are all completely happy with the outcome. God and Mama Nature sure put down some beautiful work around here. Well go figure, it didn't take long at all for my eyes to go right back to the same ground they had been so long absent from and all those quartz rocks strewn from can to can't. As kids our parents had taken us on many a Sunday drive up into those haze-shrouded hills for the day. Thinking all the way back, to the back seat that is, with my three older brothers and baby sister, it now seems my old man had just a touch of the wanderlust his own self and probably a healthy case of gold fever to boot! Rock sliding and swimming or just a picnic and some fishing may have been the excuse for the day, but I seem to recall that no matter what the activity, Dad's eyes seemed to always be on the ground. How many times had he told us all that "every time it rained, someone in North Georgia found a gold nugget ." You see, it was his belief that the "Motherlode" had never really been found and that "out there in those hills somewhere an untold fortune waited for some lucky soul." There'll be more from Alan's tale of his path to gold in a subsequent post. Until then, good luck to one and all. 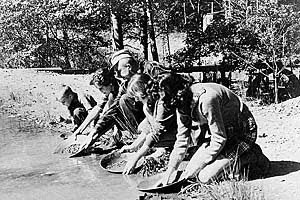 If you liked this post, you may want to read: "Listen Up All You Michigan Gold Miners (and Anyone Else Who Cares About Mining)"
Been though that country years ago, it was pretty and so was the girl. Pray you find out just how right your father might have been!